Acute kidney injury (AKI) is common in patients with cirrhosis and is associated with significant morbidity and mortality. The pathophysiologic cascade triggered by the onset of portal hypertension results in chronic renal hypoperfusion and renders the kidneys unable to compensate in the face of secondary insults such as gastrointestinal bleeding and spontaneous bacterial peritonitis. 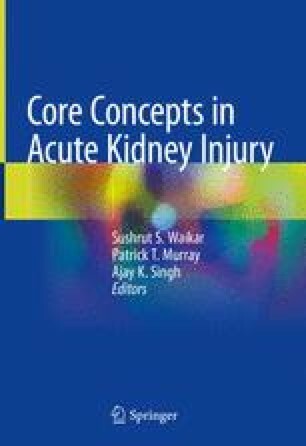 The most common etiologies of AKI in this setting include prerenal azotemia, acute tubular necrosis (ATN), and hepatorenal syndrome (HRS). Recent consensus criteria have attempted to modernize the definition of AKI in cirrhosis by adopting a threshold of a rise in creatinine of 0.3 mg/dL or 50% from baseline and by eliminating a creatinine cutoff for the diagnosis of hepatorenal syndrome. Despite these standardized criteria, distinguishing between AKI etiologies remains difficult in patients with cirrhosis. Many of the traditional means of differential diagnosis, including measuring the fractional excretion of sodium and examining urine sediment, perform suboptimally in cirrhosis. Recent studies have identified multiple urinary biomarkers associated with structural kidney injury that have shown promise for the ability to distinguish ATN from HRS. Accurately making this distinction is critical as treatment with vasoconstrictors combined with albumin significantly improves renal function and reduced mortality in patients with HRS. The most widely studied vasoconstrictor, terlipressin, has been shown to reverse HRS which is approximately 50% of cases. Although terlipressin is unavailable in the United States, small studies suggest that norepinephrine (but not the combination of midodrine and octreotide) may be similarly efficacious.